I have an exciting new website to share with you today for Wednesday Website! 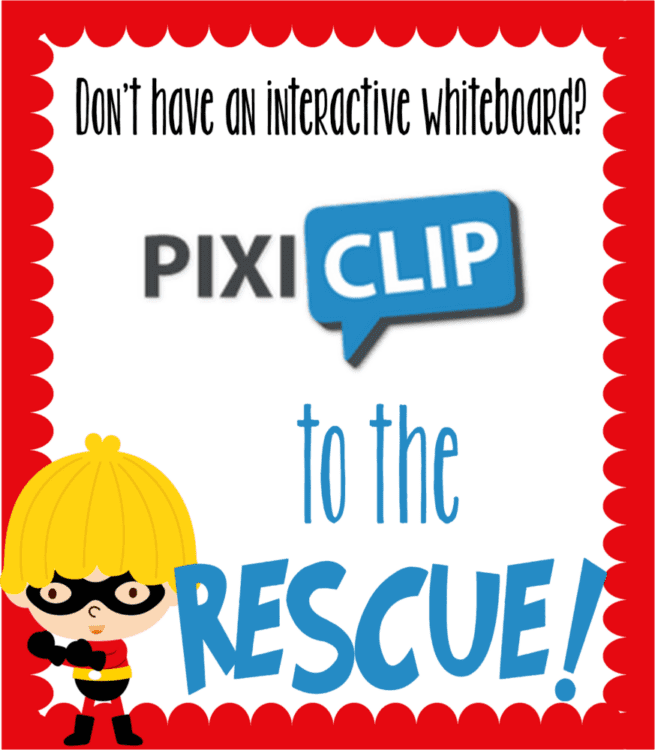 PixiClip provides the tools to give you an interactive whiteboard, and even allows you to connect your mic and webcam to add in recordings of your voice and yourself! If you are doing a flipped classroom, this would be an amazing tool! I’m not lucky enough to have an interactive white board in my room, but received a projector and document camera through Donors Choose last year. I wish I would have known about PixiClip, because it’s an awesome tool! PixiClip creates clips- up to 5 minutes of a screen capture, with your audio and webcam if you choose- that you can share publicly or privately. You could also just use the surface as an interactive whiteboard with no intention of sharing your clips. Here you can see the tools that are included- especially the ability to upload an image to work on, and a pencil and a marker to write on the image. You also are able to register for the site so you can save your clips. You can make the clips public or keep them on your page. I think if you are doing a flipped classroom this would be a fantastic tool. You could demonstrate your lesson and then share the link with your students. You can embed videos into your class blog, as well, so it’s great for giving kids a tool after they get home if they need a refresher. It would also be great for video tutorials for parents- especially on some of the non-traditional methods we’re using in math class now. Here’s a Clip where I use one day of my monthly story problems. I am loving PixiClip for this for next year rather than me just talking and gesturing with my hands- even though I’m sure I’ll still gesture. After you’re done with your video, you can choose which privacy setting you’d like and you can also name your Clip. This allows you to make your clips private so others can’t see them without going to your page- which seems great for classroom use. It also allows you to make them public, which means we could have a plethora of educational videos at our fingertips as they get expanded and more videos added. In the meantime, I’m loving the idea of just using it with my students. Have you used PixiClip before? If so, I’d love to hear about it! Click the image below to check out my other Wednesday Website posts. Thanks for sharing PixiClip. We currently use SMART Notebook in the classroom, but it takes forever to load and it certainly doesn't come out looking as nicely as the work in your video. I'm glad that you shared this because I can take this back to my staff to share a friendly tool that will not take forever to load.